Extremely durable but still lightweight, this hooded Softshell Jacket provides praise-worthy weather defense and exceptionally breathable warmth. Extremely durable but still lightweight, this hooded Softshell Jacket provides praise-worthy weather defense and exceptionally breathable warmth. Exactingly designed for multi-activity performance, the Arc'teryx Gamma LT Hoody's Burly Double Weave stretch fabric provides water-resistance, wind-resistance and great air permeability for comfort and moderate warmth. A lighter-weight version of Wee Burly Double Weave Fabric makes this new Arc'teryx Gamma LT Hoody much lighter in weight than previous versions. The rugged nylon outer has a polyester inner surface for next-to-skin comfort and a Durable Water Repellent finish, which enables water to bead-up and roll off. Not waterproof, but very water-resistant, this highly wind-resistant stretch fabric protects you against wind-chill and moves freely with your body. Good air permeability provides maximal breathability and minimal sweat build-up for extended comfort. The Arc'teryx Gamma LT Hoody is equipped with a fully protective StormHood. Single-hand adjustable drawcords can be used to perfect the hood fit, enabling you to defeat gale-force winds. The hood is also designed to turn with your head, without obscuring vision while looking from left to right, while the soft, laminated chin guard prevents uncomfortable chaffing. A new little Arc'teryx design detail that you're unlikely to notice - yet one that makes quite a difference - the No Slip Zip uses a series of speed bump-like shapes on the last few zipper teeth, preventing the zip from undoing itself. The Arc'teryx Gamma LT Hoody's main zip remains very easy to pull down with a single hand when you need to dump heat fast. 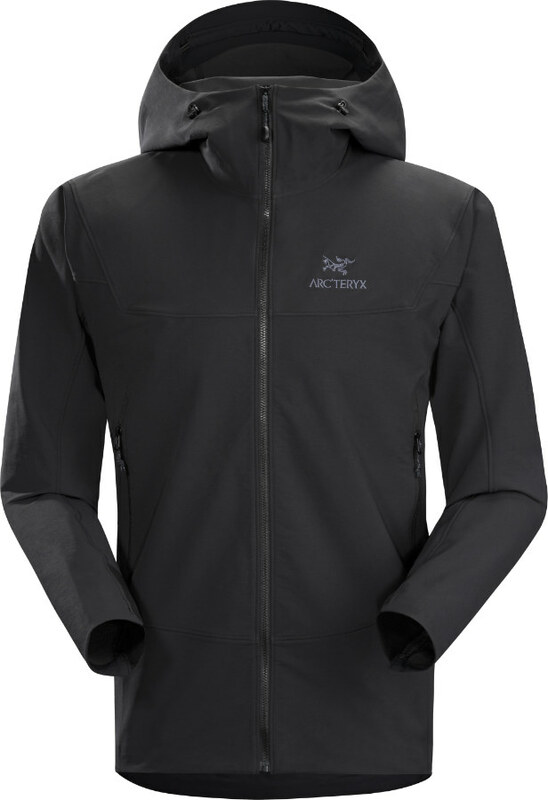 The Arc'teryx Gamma LT Hoody has articulated elbows and gusseted underarms, which helps this Softshell Jacket to move with your body, even over tricky terrain. The stretch gusset cuffs create a low-bulk, neat fitting sleeve, while the adjustable hem drawcord seals out the cold and tailors the Gamma's fit to your chosen layering system. Compared with a Waterproof Jacket with a traditional membrane, the Gamma LT offers far greater breathability, a soft feel and non-crinkly, quiet fabric. A Softshell Jacket is designed to keep you more comfortable for a longer period of time, and over a greater variation of weather conditions. Designed with highly protective features and fabric that's highly wind-resistant and water-resistant, the Arc'teryx Gamma LT Hoody will protect you from all but the worst weather. A really versatile, simple and comfortable softshell, ideal for year round use in the hills. Much more robust and protective than a Pertex-type windshell, yet far more breathable and comfortable than a Gore-Tex. Brilliant hood. Cavernous pockets. Highly recommended! Great soft shell fast delivery, would recommend to other people and buy from again. Cheapest by a mile.